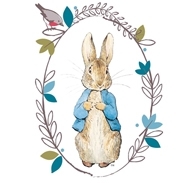 Colourful set of 2 identical placemats featuring Peter Rabbit. Coordinate with Peter Rabbit Dinner Gift set and Cutlery also available. Just wipe clean with soft cloth after each use.